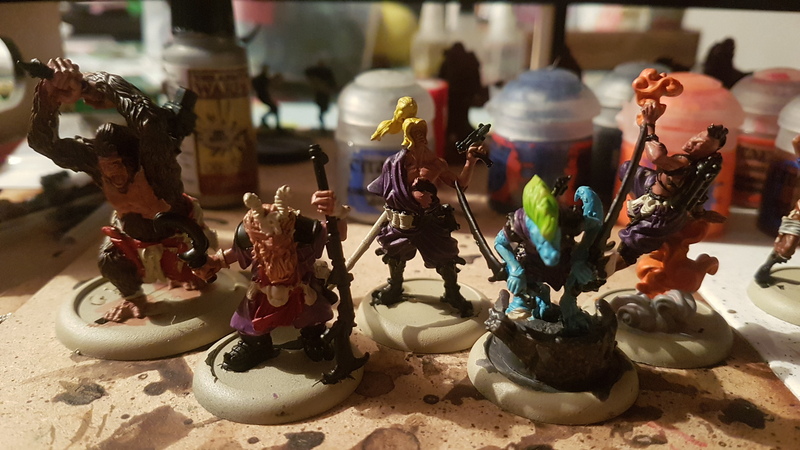 Welcome back to Tales of an Under Average Painter as I have had a few weeks off I thought an update would be in order, you will see many of the reasons I haven’t written much for this section as I have been busy doing loads of different bits. Here is my little version of drifting through the hardest part, in my opinion, of the hobby painting. So as this was supposed to be a bi-weekly set of writing I had best bring you up to speed with the last three weeks, well first there was Salute 2017, which as you can imagine brought out that kid in a sweet shop feeling, not only that but I have been working a lot recently, painting wise I have made a fair amount of progress for a change and brought some new brushes thanks to Matts article on Broken Toad brushes, not that I am expecting to improve overnight but I am determined to start getting stuff done I might even have to set my self a goal and set aside a reward for doing it!. 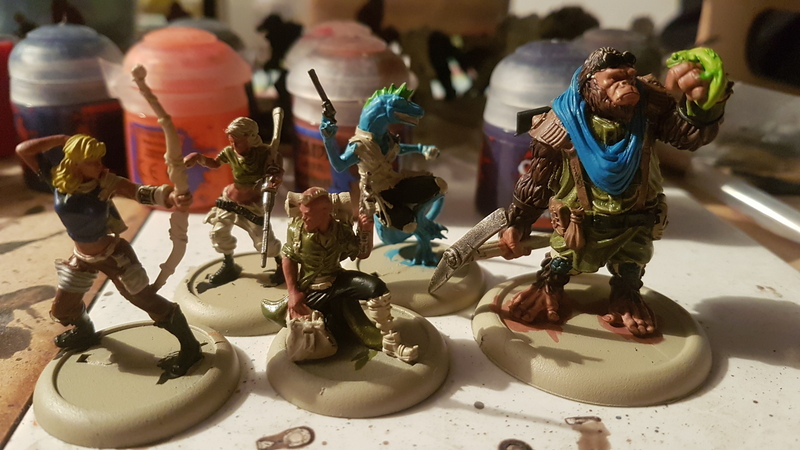 In part 1 I spoke pretty much exclusively about The Drowned Earth Miniatures which is totally funded and doing reasonably well but the more the merrier and seriously the miniatures are a joy to paint. I didn’t manage to finish the models before Salute as I thought sleep might be more beneficial for me, but I did make progress. I have also nearly completed the starter set for Rumbleslam which I picked up at Salute, although not quite as pleasing on the eye or technically difficult, the bold sculpts are still fun to paint, I also have the MDF ring built and undercoated I had planned to get the TTGUK logo on the mat but as TTCombat have etched the rumbleslam one in I think I am going to have to have a rethink. 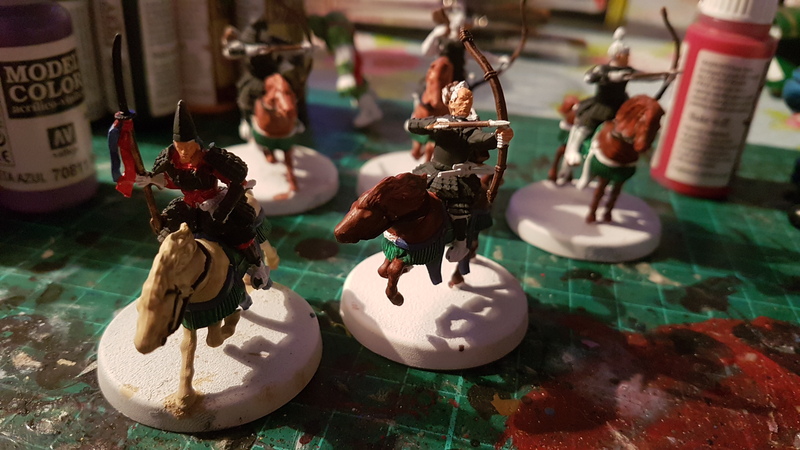 Obviously I am trying to make some headway w ith TTGUK paints but my plan off low model count is backfiring as I am finding horses really hard to paint, some are two red others just look wrong and only two look reasonable at the moment but 5 weeks in its probably to late to change my mind again, but I think I might be spoiling the next update so how about a picture instead. Although I do remember why when I started back into the hobby I opted for Space Marines. 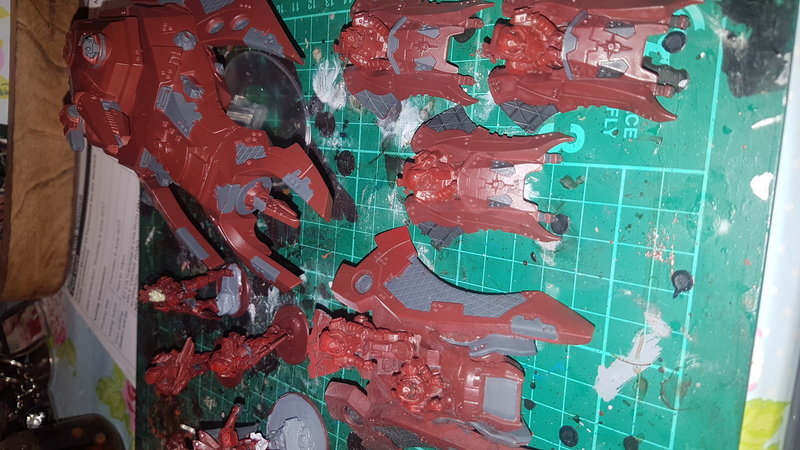 Final work in progress picture is some of the Algoryn I am working on, had I realised just how easy the studio scheme was, as demonstrated in the Kara 9 box set I would have probably done it the same as that, but instead I am going for a darker red which rules out using the red ink for shading as it doesnt show up against the current red. Unless someone knows of a really dark red ink I can use it looks as though its going to be a black or dark tone wash, at the moment though I am just starting on the base colours and a bit of highlighting, the aim being to get 1000 points up to scratch before starting on the other half of my army. I know working on many projects at once is likely the reason that I never rarely finish anything to a really good standard but the armies I want to play are pretty much brought now so I am free to spend less time building (other than new review stuff coming in) and more time building and painting, so as the weeks go on these projects should start to naturally become finished and I can get on with more of several other projects I have in the pipe line and lined up. This year I am also determined to start recording how I paint things as I naturally forget how I have painted models in the past so when expanding a force they never really seem to fit in with what I already have, which is why up until now I have always waited until I have a large collection before I start painting, which leads to a painting backlog and the dejected feeling I tend to have when painting rather than the feeling of enjoyment as I am building things. In the next update we will have some more of the same to see what progress is being made, as well as some scenery that I built over the last few weeks, as I start painting that, as well as previewing my Forces for Mantics Warpath franchise.